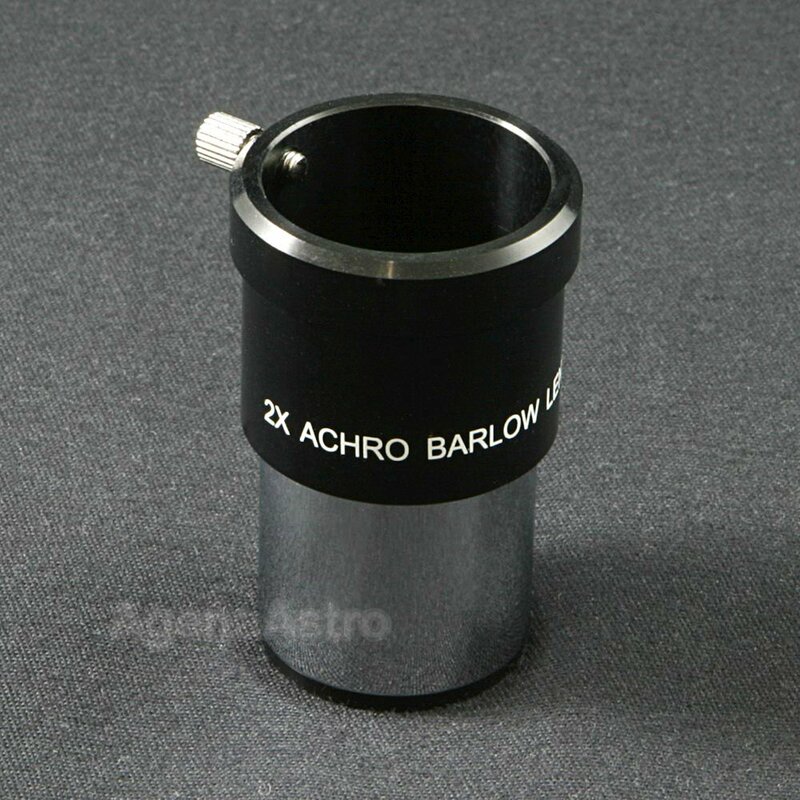 This Antares 2x barlow # B2S has a fully multicoated achromatic design and will double the magnification of any 1.25" eyepiece. It features a clear aperture of 25.3mm and a short design that enables its use in any telescope, even those that use a diagonal. The barlow element is not removable and is not threaded for filters. 4.7 (Based on 3 Reviews) 100% of reviewers recommended this product. Review by Big D starman of London, Kentucky. I use my Antares Barlow lens every night I stargaze and have never had any cons such as blurry or unstable views because of cheap construction. I use it also in conjunction with my 2" Barlow lens and still have perfectly clear views of planets and the moon. Never a problem with this product or this fine company. I always check Agena astroproducts first before buying anything for my hobby. A fantastic company that stands behind what they sale. Very trustworthy folks that will not lie to you just to make money. They like this hobby as well as all the rest of us do. Can't go wrong with Agena, I plan to buy more of my hobby needs from these fine people. Review by DanF of Burbank, CA. My Orion SpaceProbe 130ST EQ did not come with any Barlow lens. My only experience with a Barlow lens came about when I purchased an $80 telescope for my brother, and it came with a 2X Barlow that was of plastic construction. When I bought my SpaceProbe, I knew I needed a Barlow lens because the scope came with a 10mm and a 26mm eyepiece, and I knew these wouldn't be strong enough for all my viewing. I searched long and hard to find a Barlow lens. After exhaustive research, I decided to take a chance on the Antares 2X Barlow. Wow was I surprised when it arrived! Excellent lens quality. Excellent barrel construction. My eyepieces looked did not suffer one bit while using the Barlow and I can't imagine anything working better. Soon after I purchased the Antares Barlow, I then purchased a 2.5mm eyepiece. This eyepiece is actually overkill with my 130mm short focal-length scope, but even with the Antares Barlow (which is really overkill with the 2.5mm piece), I still get good images. I can't imagine a better Barlow, especially for the price. I imagine there are better ones, but for me, this fits the bill. Review by Plutonium of Saint Louis, MO.